What player doesn't want more opportunities to shoot? The main issue, however, is that players need to understand that they have to EARN their opportunities. Here are 9 (fairly easy) ways to EARN more opportunities to shoot. It doesn't get more simple than this. By simply sprinting in transition, players can create open layups/dunks or spot up opportunities as the defense is scrambling. This is especially a great way for bigs/posts to get touches and easy buckets. It's not rocket science, but there's a much greater chance to receive a good look at the hoop after a good, hard cut rather than a casual "banana" cut. Another key here is changing pace. This applies with AND without the ball. By changing pace, it makes it more difficult to guard and will lead to more opportunities to score. This requires understanding the situation and where your teammates are on the court. It'll be tough to get an open look if you "creep" into space near your teammates. This completely messes with the spacing in the half court. In transition and in half court settings, it's important to find the open space on the court and maintain proper spacing to get open shots. This is simple non-verbal communication that can go a LONG way. Think about if you're attacking the basket and you see your teammate standing open on the wing. If they have their hands on their sides, are you going to want to pass to them? What if they have their hands up and are giving you a target? One of our favorite phrases comes from our friend Coach Liam Flynn who says, "Have hungry hands" when receiving the ball. 5. Catch Low and "Shot Ready"
This is directly related to the last point of having hands ready. A lot of "open" shots aren't taken because the player simply isn't ready to shoot when they catch the ball. When receiving the ball while standing straight up, it takes so much more time to prep your shot than if you're catching "shot ready." Many times players can get completely ready to shoot while the ball is in the air as they are waiting to receive it. Cutting and using screens BEFORE they are set is a pet peeve of mine and many coaches out there. The best way to get open is by changing pace, WAITING for the screen to be set, and then cutting hard. Simply doing this can result in many more shots throughout the course of a season. One of the most common misconceptions is that players are supposed to set screens ONLY to get other players open. Oftentimes, the players that set great screens are the ones that end up being the most open. By setting great screens, many times the defense focuses much more on the cutter, leaving the screener wide open. Steph Curry is a great example of a player that does this effectively. Two of the toughest things to guard are (1) ball movement and (2) ball fakes. Ball fakes are a great way to create space especially if players are going up against pressure defense. Specifically, a great shot fake can help even average shooters gain more opportunities to shoot and score. It's important to work on the shot/pass fake on a consistent basis to be effective in game situations. This should be the most obvious of them all! Just like I said at the beginning of the article, you have to EARN the right to shoot. By consistently putting in the work day in and day out, there's a much better chance that you'll have the freedom to shoot more and more shots. Keep these 9 things in mind throughout the year and continually work on each fundamental and you'll undoubtedly get more opportunities to score. Of course Dr. 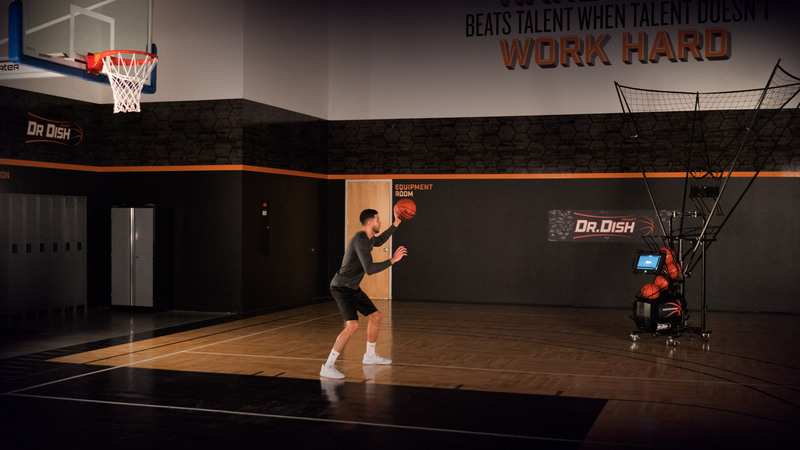 Dish basketball shooting machines are the most efficient and versatile machines to help you train hard, train smart, and train with a purpose. Did we miss any ways to get more shots? Let us know in the comments!